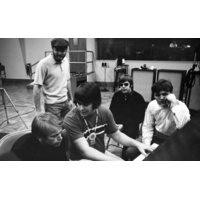 The Beach Boys have often been called "America's Band", and Allmusic has stated that "the band's unerring ability... made them America's first, best rock band." The group has had 36 United States Top 40 hits (the most by an American rock band) and 56 Hot 100 hits, including four number-one singles.Rolling Stone magazine listed The Beach Boys at number 12 on their 2004 list of the "100 Greatest Artists of All Time". The core quintet of the three Wilsons, Love and Jardine was inducted into the Rock and Roll Hall of Fame in 1988.